Essential polyunsaturated fatty acids (PUFAs), vital to the normal functioning of the body, belong to several different chemical families. The fat in fish contains so called omega-3 PUFAs (also known as n-3 PUFAs), which differ from omega-6 PUFAs found in vegetable oils. Omega-3 and omega-6 PUFAs have different roles in body metabolism. Fish oils contain about 50 different fatty acids, and are the main source of the omega-3 essential PUFAs eicosapentaenoic acid (EPA) and docosahexanoic acid (DHA). EPA and DHA levels are very low (or absent) in domesticated land animals. The habitat in which the fish grow has a major influence on their fatty acid composition. The fish obtain omega-3 PUFAs by eating plankton, which in turn contain more omega-3 PUFAs the colder the sea water (cold water fish also have a higher fat content). Cold water fish such as salmon, tuna and mackerel have the highest levels of omega-3 PUFAs. Farmed fish fed commercial fish food contain lower levels of omega-3 PUFAs. Omega-3 PUFAs present in fish oil help maintain healthy cardiovascular function (i.e. normal aggregation of blood platelets, formation of thrombi, and healthy blood triglyceride levels and blood pressure). Omega-3 PUFAs are important for maintaining a healthy immune system and normal inflammatory response. Omega-3 PUFAs are required for the normal development and function of the brain. The generally recommended intake is 1000mg taken 3 times daily. Are there adverse effects from taking Fish Oil? Fish oil is generally well tolerated, although gastrointestinal disturbance may occasionally occur. There are no reports of serious adverse effects from taking fish oil. Large doses of fish oil supplements may result in a significant increase in total calorie intake. Patients taking anticoagulants should exercise caution if taking supplements containing Omega-3 PUFAs, which may inhibit blood clotting. Patients with diabetes should exercise caution if taking fish oil supplements. Cod liver oil should not be used as a source of omega-3 PUFAs, as it contains high levels of vitamin A and vitamin D, both of which can be toxic in high doses. High doses of folic acid may interfere with anti-convulsive medicines prescribed for epileptics. Fish oils used by Pharma-Nord are derived only from fish found in the Northern Atlantic and South East Pacific oceans. All fish oils are carefully screened to ensure that there is no contamination by heavy metals, pesticides or industrial toxins such as dioxins. 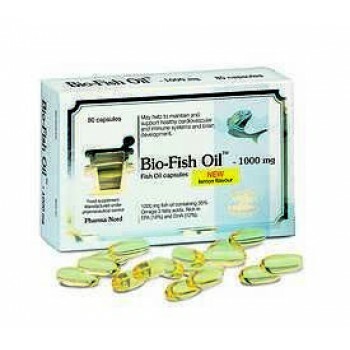 Each capsule of Bio-Fish Oil contains 1000mg of fish oil (in the form of triglycerides), corresponding to an EPA content of 170mg/capsule and DHA content of 115mg/capsule.. Pharma-Nord recommends 1-2 capsules 1-2 times daily. Each capsule of Bio-Marine Plus contains 500mg of fish oil (in the form of free fatty acids), corresponding to an EPA content of 166mg and DHA content of 118mg, 100microgm of folic acid (equivalent to 50% RDA), and 1microgm of vitamin B12 (equivalent to 100% RDA). The addition of vitamin B12 and folic acid to fish oil reduces the risk of congenital birth defects, and is more effective in reducing menstrual pain. Pharma-Nord recommends 1-4 capsules/day. 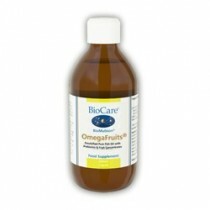 Bio-Fish Oil and Bio-Marine Plus are stabilized with 1 IU of alpha-tocopherol/gm. Bio-Fish Oil or Bio-Marine Plus are most effective when taken with the Pharma-Nord antioxidant supplement Bio-Selenium plus Zinc. 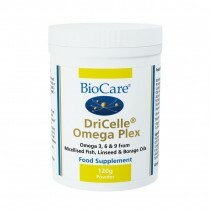 Bio-Fish Oil and Bio-Marine Plus are manufactured under Danish pharmaceutical control.